I was hungry for some chili so I made this up out of the clear blue by looking at what I had in the cupboards. 1. In a large skillet or 2 quart saucepan, add water and onion and saute for about 5-6 minutes. 2. 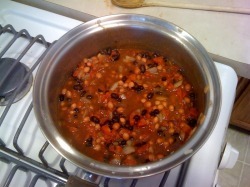 Add the rest of the ingredients and simmer on medium heat for about 10-12 minutes. Super simple but very yummy! You can eat this straight or over a vegan hotdog (Smart Dog) and a piece of Ezekial Bread toast.